Some parents raise their kids to inherit the family business. They start by sweeping floors and if they are really lucky, they end up running empires. Most of us, of course, don’t want to follow in our fathers’ footsteps. We want to make new footprints that we can honestly call our own. Our family business was the movie business. We didn’t make movies; we projected them on the big white screens in darkened theaters, and asked people to pay for the privilege of sharing the unique experience of film. Most of the time they were more than happy to do so. Which made us very happy too. 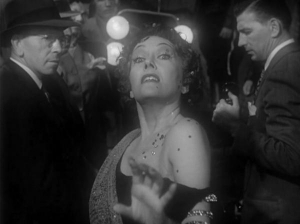 Gloria Swanson as Norma Desmond in Billy Wilder's "Sunset Boulevard"
Norma was talking about silent movies, of course. But.a couple of generations later my schoolmates and I had joined all those wonderful people in the dark. Movies were magic. Movies were proof that dreams really do come true, if we could only find our way to the other side of the rainbow. This blog is about both sides. Bravo George. What a great avenue for you to share you wit and insight. I’ve missed reading you and am delight you decided to start blogging. I enjoyed your Oscar stories -very amusing. I look forward to reading more. You’re a wonderful writer and have rich stories to tell. Write back with your willingness and availability! Thank you. Thank you for your comment. And please forgive me for being such a poor correspondent. Thank you for your kind invitation to appear on your Friday morning show. Unfortunately I’m not available ’til September — By George is on hiatus at the moment — but if you’re still interested, I’d be happy to do it then. Every time I see a Candian walk of fame show , I wonder why the late Brian Lineham isn’t among that crowd. He was a real pioneer and great interviewer. What are your thoughts on that idea…..ie. nominating him for that honor. delayed reaction…. the drugs just kicked in. By George, you were, you are, and you always will be the coolest, funniest, cleverist, human in show business. Thank Gawd for WordPress, so now billions can see what millions already know about you. Keep on rockin’ in the free world George, look forward to reading you regularly. Just saw your new entertainment blog/column for the first time tonight! I’m very impressed! Seem to be a wee bit behind in my blog, let alone my blog correspondence! (sigh) Now coming back from a nine-month hiatus from blogging. Planning to restart my engine this month. Big hugs to you and yours. I have just finished your biography of Brian Linehan. I am stunned and so impressed with your work. I would like to contact you, because I have so many things I would like to say to you. This blog seems outdated, but still links from other websites. If is current still, please let me know, and I will continue my comments. I’m glad you enjoyed the book on Brian. And I’m sorry I haven’t replied to you before now. I am currently on a nine-month hiatus from blogging but plan to return to it this month.